High school students usually take one of two approaches to the ACT: no preparation as they depend on the knowledge they’ve gained through the years, or falling into an overly stressful mode as they try to cram studying into every free second of their day and night. You don’t need to fall into either category though. Prepare yourself by getting to know what you’ll see on the ACT and taking on a structured study plan that isn’t overwhelming. This fast-paced section will test your basic knowledge in grammar and sentence structure. With the most questions of any section at 75, it is not the longest in time since it only allows 45 minutes. So it’s important to keep a steady pace during this portion of the exam and don’t allow yourself to get hung on difficult questions. Fortunately, this section is not designed to particularly trip you up and most students usually finish. The structure of this section is almost like editing someone’s essay. There will be five passages with 15 follow-on questions regarding the grammar and punctuation errors found (or not found in some cases). Aside from just basic grammar and punctuation, there will also be questions to test your rhetorical skills and writing style, mostly conciseness and clarity issues. This section is the longest as far as time goes at a whole 60 minutes to answer 60 questions. It is the only section that allows a whole minute per question, but it is also usually the most challenging section as it is designed to increase in difficulty throughout the test. So again, it’s important to not get hung up on a question you might not know, especially early on. The first half of the ACT Math Section is purposefully easier than the last half. The last several questions are extremely advanced and will take the most time. Throughout this section, you’ll see questions about basic algebra as well as geometry and trigonometry. There are various levels and topics covered that date back to late middle school, early high school so a broad review of the mathematical skills you’ve learned will be key to succeeding on this portion. It’s also important to note that unlike the SAT, the ACT does not have a provided formula sheet so any basic formulas you’ve learned throughout the last few years should be memorized before exam day. Another difference from the SAT is the dedicated Science Section. This is one of the ACT’s 35-minute portions and has 40 questions designed to test a student’s ability to read and analyze charts and graphs. It doesn’t necessarily test basic scientific knowledge but focuses on the ability to analyze and form basic conclusions based on information given. The section is broken up into six segments with a scientific experiment presented and follow-on questions the test-taker must answer. These experiment passages cover some scientific fields like biology, astrology, physics and chemistry. Many of these passages and questions are challenging for students and time-constraints can be an issue. 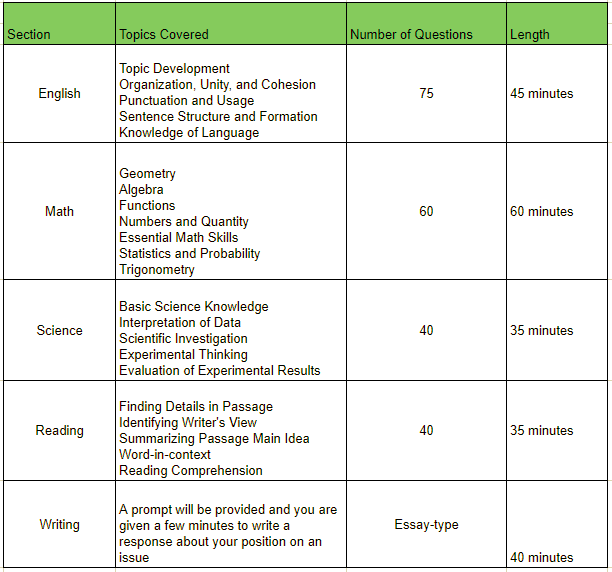 Just like the Science Section, the Reading Section is the other 35-minute section and includes 40 questions. Also like the Science Section, this whole section includes passages and follow-on questions. However, these passages are even more time-consuming as they consist of 1000-word, college-level essays that the test-taker must read and analyze to answer the follow on questions. There are four passages, one of each in prose fiction, social sciences, humanities and natural sciences in that order. The questions will test your ability to determine the meaning and intentions of the passage. It’s designed to make you go back and read through the passage again and find the location of the evidence so it can take time. If broken apart evenly, you have less than nine minutes to complete each section so reading and rereading can take up a lot of time. This optional portion allows test-takers 40 minutes to write a full essay about a provided writing prompt. Forty minutes isn’t a lot of time when you consider the thought process, preparation, writing and editing phases of completing an essay. It’s important not to get too hung up on any one phase in order to complete the smooth end product. The prompt you must write on will be a topic familiar to most students. There will be three different perspectives regarding the topic which you must write about as you form your own clear position. In order to write a successful essay, your writing should be written clearly and concisely with evidence and displays of critical thinking skills. As you prepare for the ACT, don’t get hung up on unnecessary details which won’t be applicable. Study what you need to and familiarize yourself with areas you feel weaker in. Practice exams can help you identify these areas so you know what to focus on. More than anything, it’s important to enter test-day with a clear mind, so sleep and focus are vital to success.